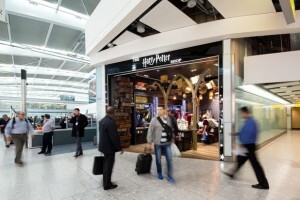 THE HARRY POTTER™ SHOP has officially opened its doors to passengers at Heathrow Terminal 5. The new 600 sq.ft. store in Terminal 5 has opened its doors today, the same week as the release of Warner Bros. Pictures’ highly anticipated Fantastic Beasts and Where to Find Them. THE HARRY POTTER™ SHOP sells over 200 items, many of them exclusively at Heathrow, from across J.K. Rowling’s Wizarding World. The shop sells newly released products from Fantastic Beasts and Where to Find Them, as well as collectibles, gifts, novelties and souvenirs from Platform 9 ¾ at King’s Cross Station and the West End hit play ‘Harry Potter and The Cursed Child Parts One and Two’. The shop will be open 7 days a week from 5:30am-­10:00pm and will be visited by more than 16 million passengers coming through Heathrow Terminal 5 each year to travel around the globe.